Benjamin: Well, I really don’t see many big changes in five years, it is a very short time. As an example we can look back a few years ago when SQL Server in-memory technologies like Hekaton and columnstore indexes were originally released. We were very excited about these technologies but later realized that they were initially released with serious limitations leaving us to wait for them to mature and become widely adopted. So I hope a wide adoption of these technologies, especially Hekaton, in the next few years. Currently Microsoft has announced SQL Server for Linux so I hope that release is widely used within the next few years too. I confess I was very skeptical when I learned that this SQL Server version was not really a Linux port but instead the same Windows executable running on a Linux process. I know it makes perfect sense from the time-to-release point of view so we all hope doing this does not have any performance limitations. I started my career with Unix back in the 90s so it is cool be to working in this platform again. I also worked with Linux since the beginning and remember that for a few years nobody even knew what Linux was. Regarding SQL Server version adoption, we know the market is usually a few versions behind so I would not be surprised if in five years the most popular versions are SQL Server 2014 or maybe SQL Server 2016. Finally, although companies are using or exploring the public cloud in some way, sometimes minor, at least with the current technology, most mission critical databases will continue to run on SQL Server on-premises. Benjamin: Of course not, it will evolve, actually it is always evolving, changing every day but will not be replaced. This also correlates with my earlier comment that companies will continue to use SQL Server on-premises. As a matter of fact, writing has been a big challenge for me. Being English my second language I am extremely surprised that I ended writing books. I still remember the days when writing a 2-3 pages article was a big challenge which was even afraid to publish. I finally started blogging and was pleasantly surprised when after writing just a handful of articles about the query optimizer, Red Gate offered me to write an entire book about the subject, which was published in 2011. I’ve also been doing SQL Server presentations all over the world. I just came back from an amazing SQLSaturday in Chile and I am scheduled to present in a conference in Brazil soon. Benjamin: I haven’t read any book in a long, long time so probably I don’t have much to say here. And probably the last ones I read were technology or music related. So about SQL Server I would always recommend anything with the name Kalen Delaney or Itzik Ben-Gan on it. The late Ken Henderson was one of my favorites as well. 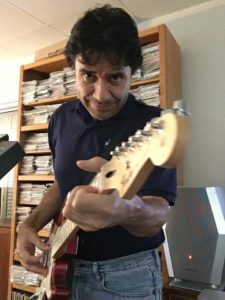 Finally, anyone who would read me even a little bit on twitter or Facebook may know that more than reading, I am a huge fan of rock and roll music, so I would usually prefer listening to records, going to concerts or playing guitar. Mohammad: For someone who’s career focus has been on one aspect of SQL Server (i.e. high availability), do you think it would be wise for them to become a “jack of all trades” by starting to learn, SSRS/IS/Azure, etc. or remain focused on their area of expertise? In another words, which would you say is more valuable? mile wide / inch deep or inch wide / mile deep? Benjamin: This is a tough question and one I had myself several times in my career. And probably there is not a correct answer here. Back in the late 90s while working with several database technologies I decided to specialize in SQL Server. I initially tried to cover everything SQL Server just to realize that may need to specialize even further. I remember learning SSAS and the entire BI stack but never worked much with it. Interestingly I became an advanced DTS developer because I worked in a large project using this technology but never got really advanced on its replacement, SSIS. So I think now I try to cover everything related to the SQL Server engine and perhaps specialize in query tuning and optimization and SQL Server performance in general, which no surprise are also the topics I write and present about.